We go through different recipes daily from many sources and especially blog authors get to know lot of delicious and innovative recipes from their fellow bloggers as well other than from the cookery shows, cook books etc. Many time I decide to try out some of those wonderful recipes from my fellow bloggers when they post it but then I totally forget them as I always try to cook with the ingredients available in my pantry and I don't bother much to think what to make for the day. But this recipe of Radhika at Tickling Palates was in my mind from the time she posted it maybe because it was so unique or Is it because that was her guest post for Kavi's Cooking with Kin Series Event which gained my attention since I was also a part of the event with my Soy Granules Kheer. Also I make kheer/payasam often since my son's request for them comes more often than any other desserts. This is the first recipe I tried from my fellow blogger friend, Thanks a lot Radhika for sharing this beautiful recipe with your friends and readers. It tasted just perfect and delicious, my family loved it - especially my son .Check out for the original recipe here as I have made slight variations that suits our taste buds. Wash and soak the Sago/Sabudhana in water for 30-45 minutes. Heat up a thick bottom vessel, pour the ghee. Add cashews and saute to golden brown, remove and keep aside. Reduce the heat to medium, add raisins and saute till they plump up, remove and set aside. Drain off the water from sago/sabudhana and add to the carrot and saute for a minute or two. Pour 1/2 cup of water and two cups of milk, stir well and let it boil. Simmer the heat to medium and let it cook till sago turns transparent. Pour rest of the milk, stir well and let it boil again and then cook till the kheer start to thicken for about five-seven minutes(Kheer thickens fast because of the sago). Add the cardamom powder, stir well to mix. Switch off the stove. Garnish with ghee fried cashews, raisins, strips of grated carrot and serve warm or chilled. Enjoy!!! i too bookmarked this delicious kheer,yet to try...looks super delicious..
Congrats on the Win...u deserve!! Hope everything is fine,I was wondering what happened to you..take care dear. Congrats for winning..both are awesome. Yummy yum delicious kheer..& Congrats on all your prizes,Keep rocking!! Congrats you lucky girl, the kheer looks superb..
Wow! Great!Congrats.Kheer looks delicious and colourful. Congrats on your win Prathibha...It surely feels great to win giveaways. Carrot sago kheer adipoli, congrats for winning the giveaways. Wow. Looks real good. Wanna taste it right away. There is an award waiting for you at my space. Do visit. 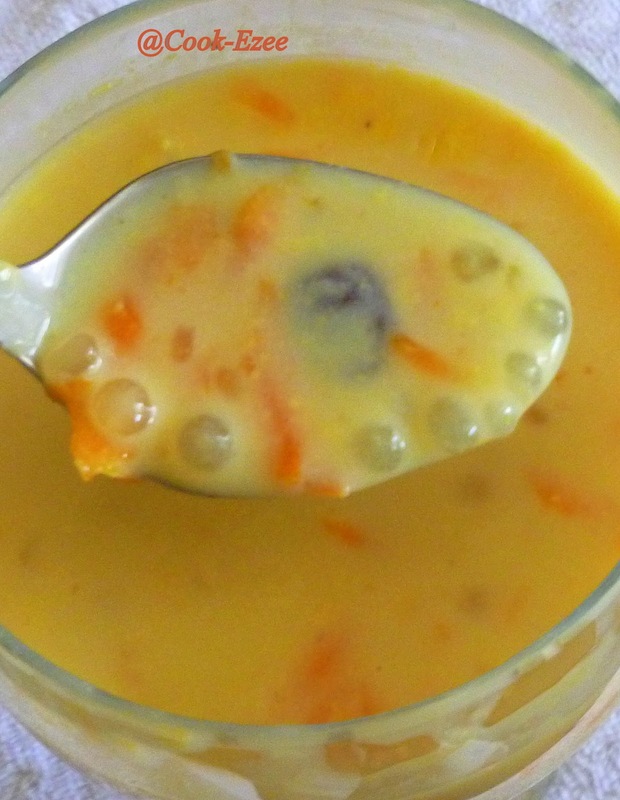 yummy and very tempting .nice combo of sago with carrot..lovely clicks..